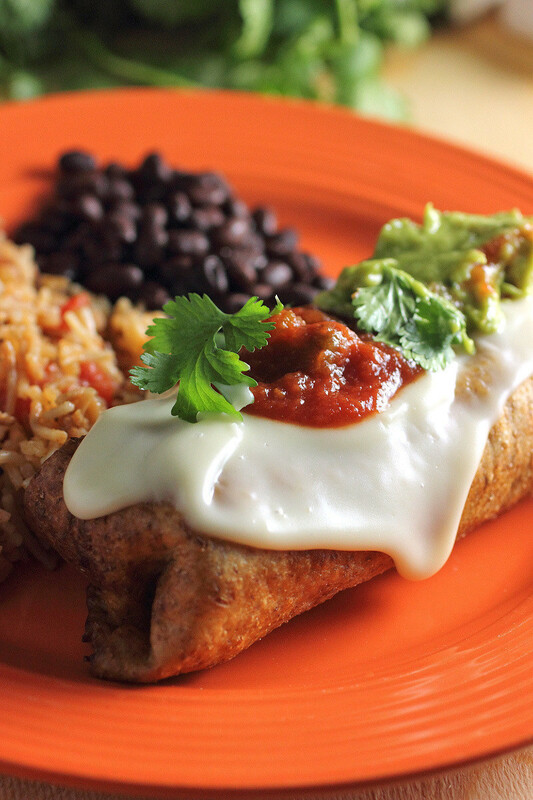 These Chimichangas will have you wishing you were in Mexico! These Chicken Chimichangas are super easy and simple. Serve with rice and beans and you will be in fiesta heaven. In a large sauce pan, drizzle the olive oil and heat on medium heat. Season the chicken breast on both sides with salt and pepper. Place the chicken breast inside the pan and cook on both sides for 7-10 minutes until firm. If the chicken isn't all the way cooked, don't worry because you will place back in the pan. Once the chicken has cooked remove from pan and set aside. Leaving the chicken bits and fat in the pan add the 2 tablespoons of butter and allow to melt. Once melted add the onion and cook for 7 minutes until onions are completely translucent and slightly brown. While the onions are cooking, begin to shred the chicken using forks. Once the chicken is shredded, return to the pot with the onions and stir. Add the siracha, spices (cumin, chilli powder. and garlic powder) and chicken broth. Turn on low and allow to simmer for 10-12 minutes and set aside. Pour the corn oil in a large shallow (deep) pan and heat on medium heat. Taking a flour tortilla, spoon about 1/3 cup of the chicken mixture in the middle of the tortilla. Take one end of the tortilla and fold over the chicken and roll in the opposite direction tuck in the sides of the tortillas as you roll. Make sure they are rolled tight and set aside until all chicken has been used. Place a tortilla, seam upward, into the hot oil and allow to fry for about 1 minute. Using a spatula or slotted spoon flip the tortilla onto the other side and allow to fry for another minute. To avoid the chicken filling pouring out of the tortilla, you can use a toothpick to secure the seam. Turn the chimichanga to a plate lined with paper towel. * Another option: You can brush the tortillas, after they have been rolled, with corn oil and place in the oven for 10-15 minutes or until the tortillas are crisp. Once the tortillas are cooked, top with hot queso cheese and other desired toppings (salsa, cilantro, and guacamole).